Hey hey! 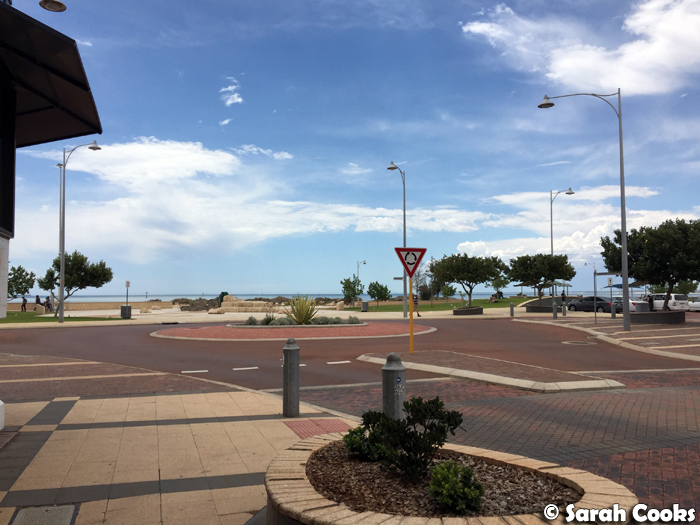 So at the start of December, I went on a little work trip to Geraldton! 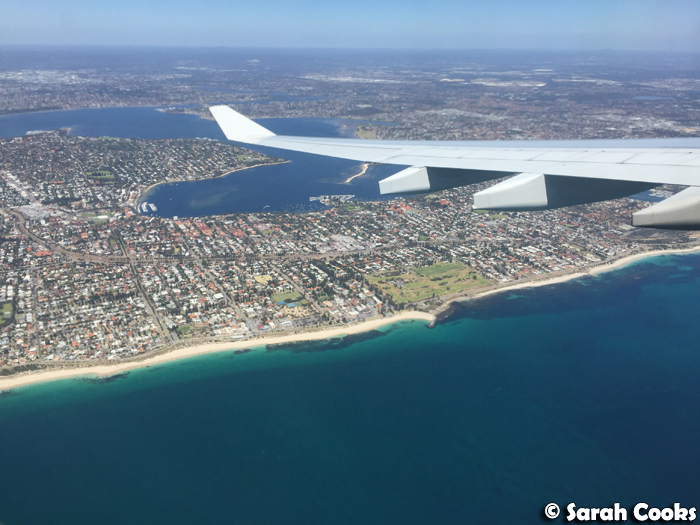 FYI - Geraldton is a coastal city in Western Australia, an hour's flight north from Perth. (Or a four and a half hour drive if you're feeling energetic!) I was there for two nights with a couple of co-workers, doing the night shift (7pm to 5am, oh my goodness! ), but we still managed to fit in a few decent meals around the work and odd sleeping patterns. Let's take a look! I'm not the only one who's super interested in plane meals, am I? 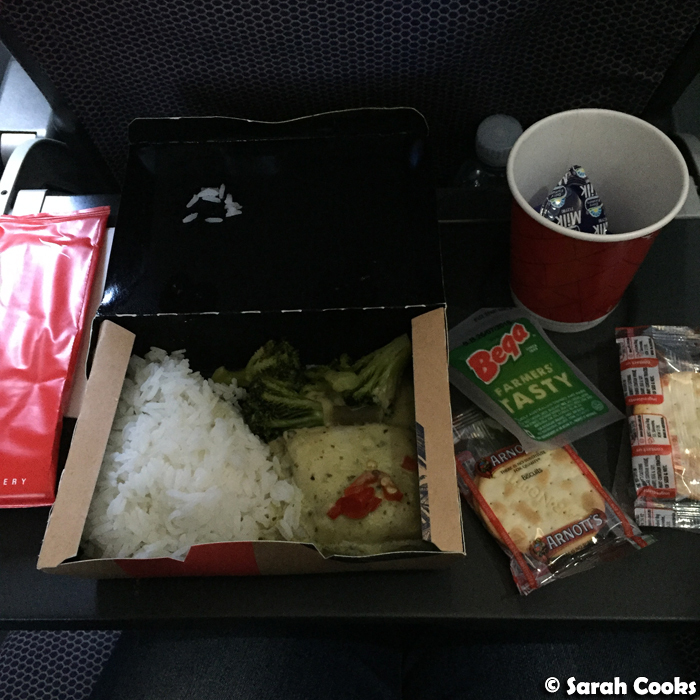 Well, either way - here's a picture of the meal we got on the Melbourne-to-Perth flight (Qantas). It was a fish green curry, and there was also cheese, crackers, and Bounty ice-creams. And Louis Theroux documentaries to watch! Heck yes. I think my seatmate thought I was weird for taking this photo, but oh well. 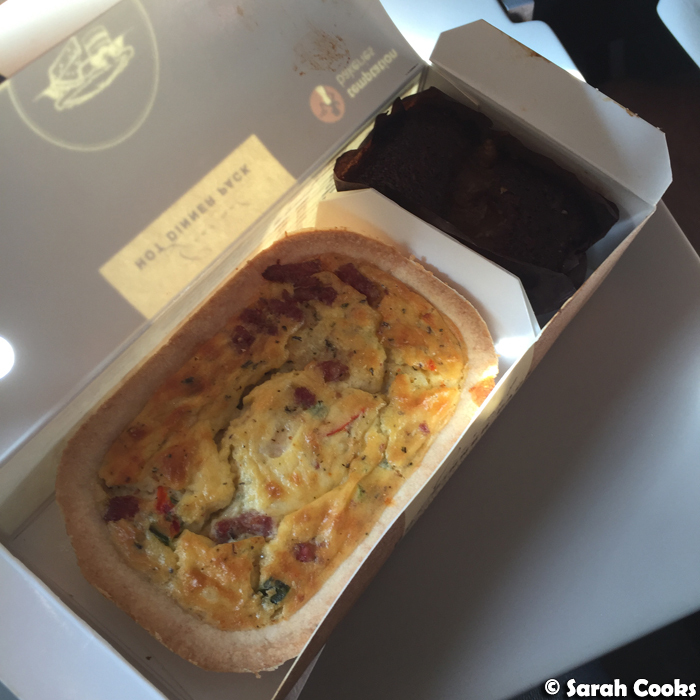 The food on the one-hour Perth-to-Geraldton flight (also Qantas) was surprisingly good - hot quiche and sticky date pudding, woohoo. 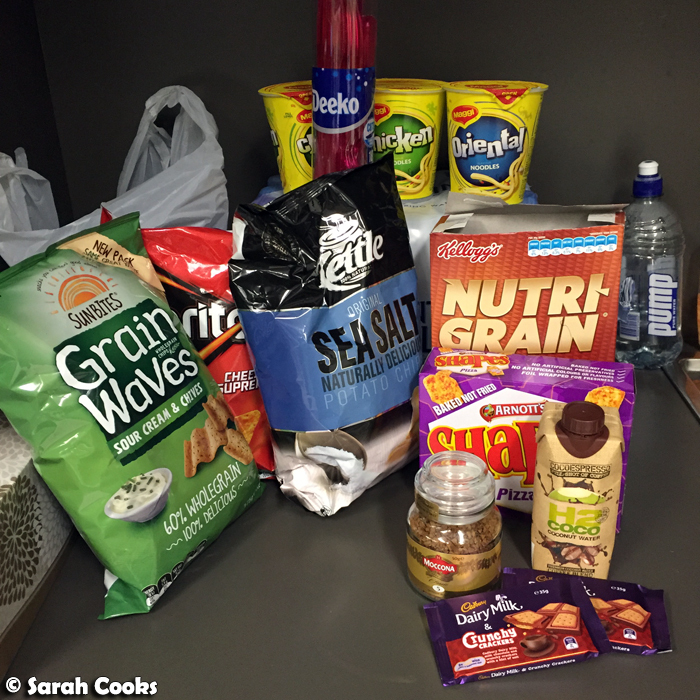 By the time we checked in to our accommodation, the supermarkets were closed and we didn't have time to sit down to dinner before work, so we went to a servo and bought lots of snacks to keep us going throughout the night. Also, I love snacks. 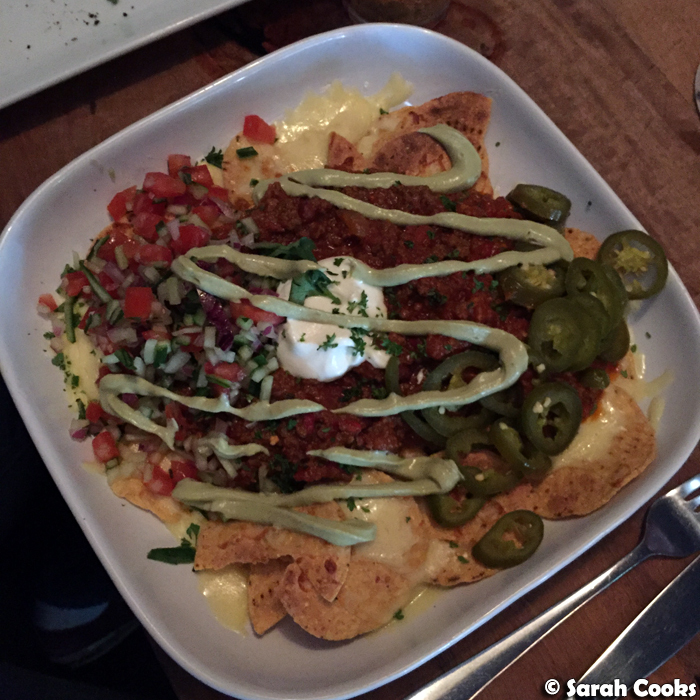 I put the above photo up on Facebook, and some friends teased me: "Are you going to blog this meal?" Yes! Yes I am. Heh. So here are some thoughts: Sour Cream and Chives Grain Waves are seriously addictive, Pizza Shapes are the best of all the Shapes, corn chips aren't as good as potato chips, Nutrigrain is surprisingly delicious, and those Dairy Milk & Crunchy Crackers are so good! (PS the ones with the salty crackers are better than the ones with the sweet biscuits). 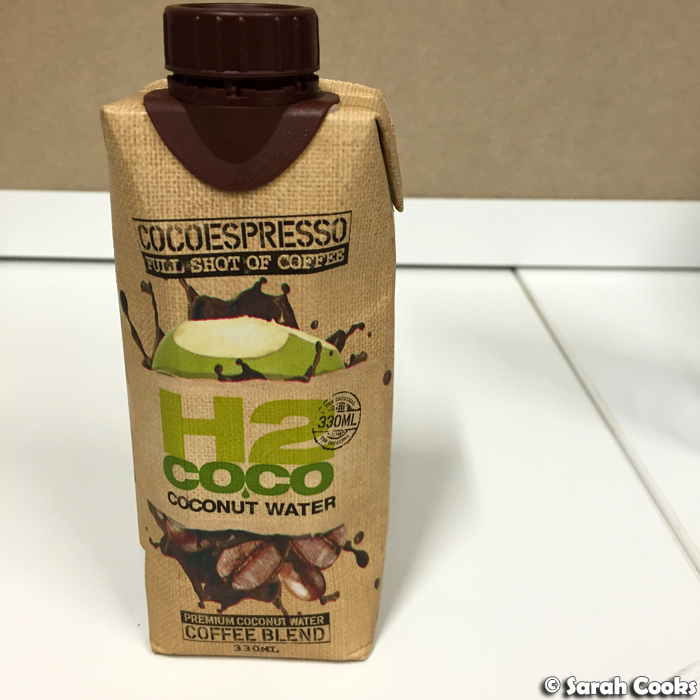 Another thing, I bought this coconut water coffee thing at the servo, because I knew I'd need caffeine to get through the night shift, and this was the only thing that contained espresso and wasn't a super sweet and huge milk-based drink that would fill me up before any of the caffeine actually hit me. Spoiler alert: it did not taste good. So! The next day we went into town and had a proper meal for breakfast (or was it lunch? It was the first meal of the day but it was at 1pm, whatever) at The Jaffle Shack Cafe. My buddy Jimbo had googled this place and it turned out to be very good! 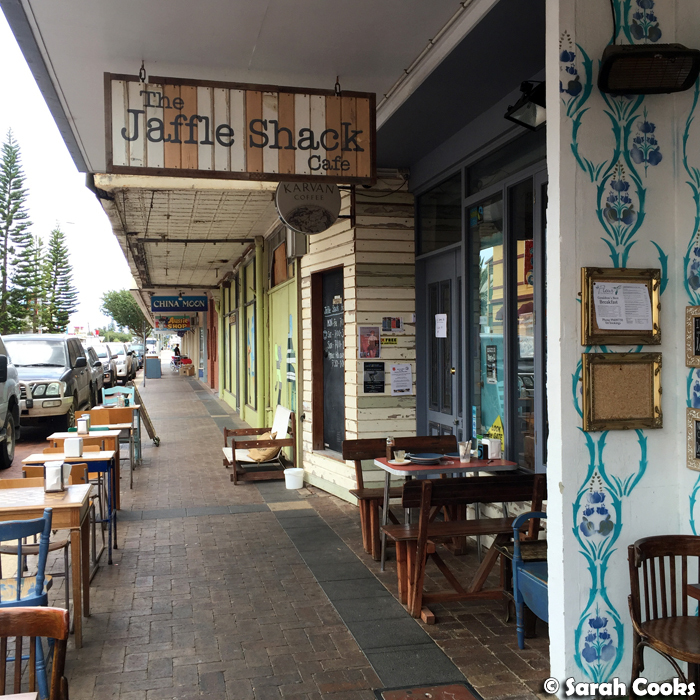 The Jaffle Shack is a cute little cafe, serving (duh) a variety of jaffles with fancy fillings. 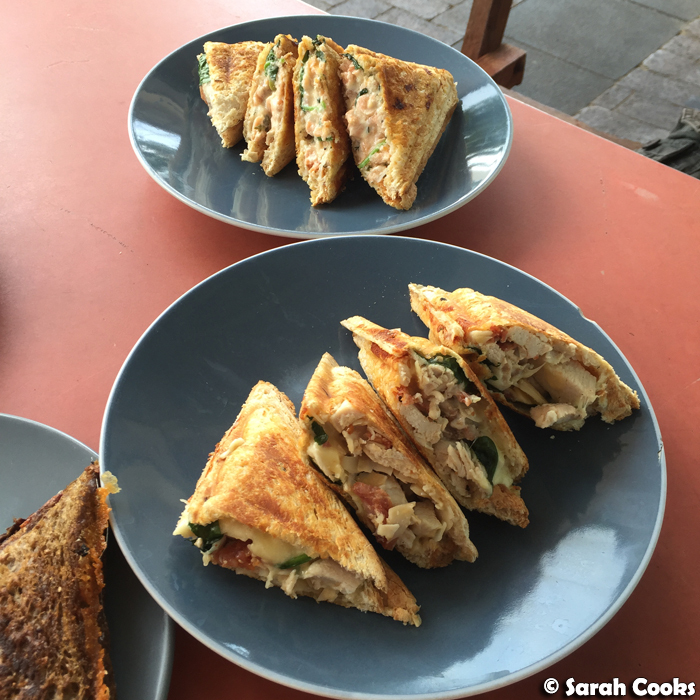 In addition to the much-needed coffees, we ordered a few jaffles to share. I particularly liked The Brekky ($12), with bacon, egg, mushroom, pesto and cheese; the Hot Dog on rye ($12), with spicy chipolata, caramelised onions, cheese, mustard and tomato sauce; and the Nutty Chicken ($12), with chicken, chorizo, almonds, basil, mozzarella, spinach and aioli. 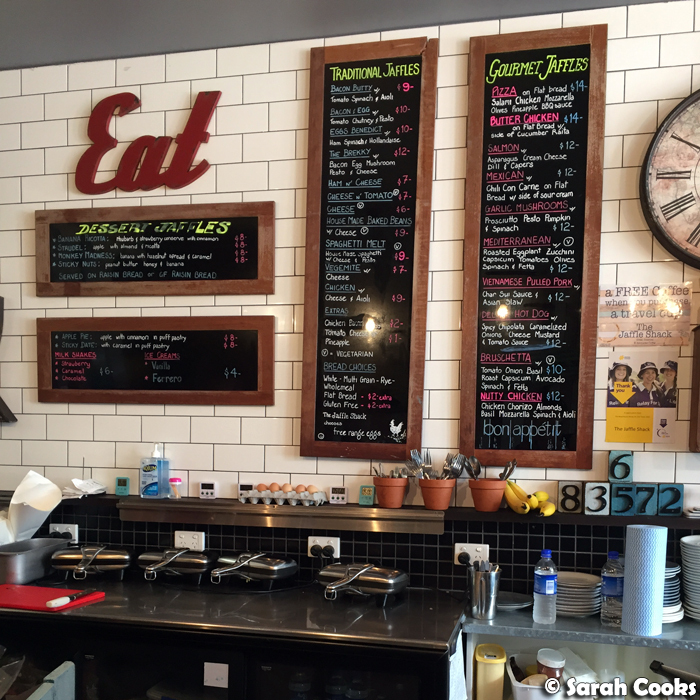 The coffee was good and the jaffles were tasty and well-priced. The only negative was that they were quite slow to come out, as they're all made to order. But either way, I recommend this place. 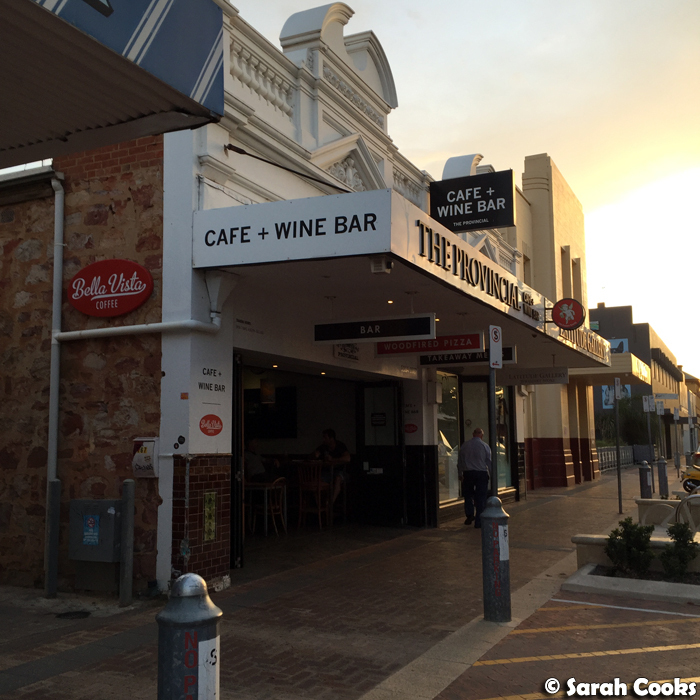 Here are a couple of pictures of Geraldton itself. 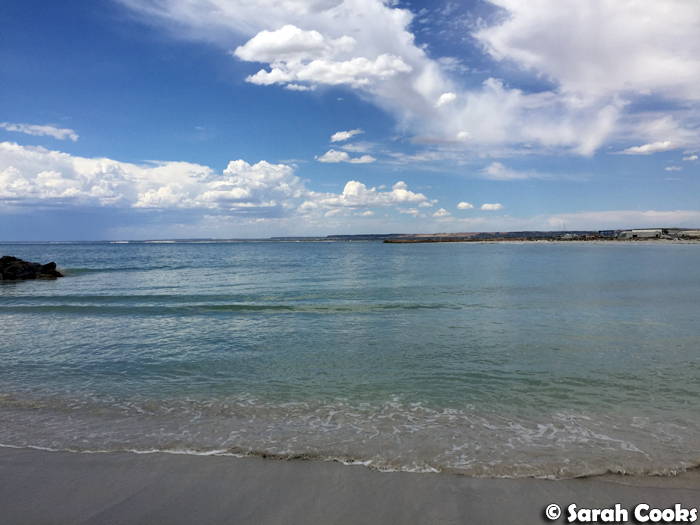 (And don't forget the picture of Pages Beach at the top of this post!) Obviously as we were there for work there wasn't much opportunity for sightseeing or major fun times, but I did manage to get five minutes to dip my toes in the water at Pages Beach to cool off. Yay! Later that night, we went to The Provincial for dinner. 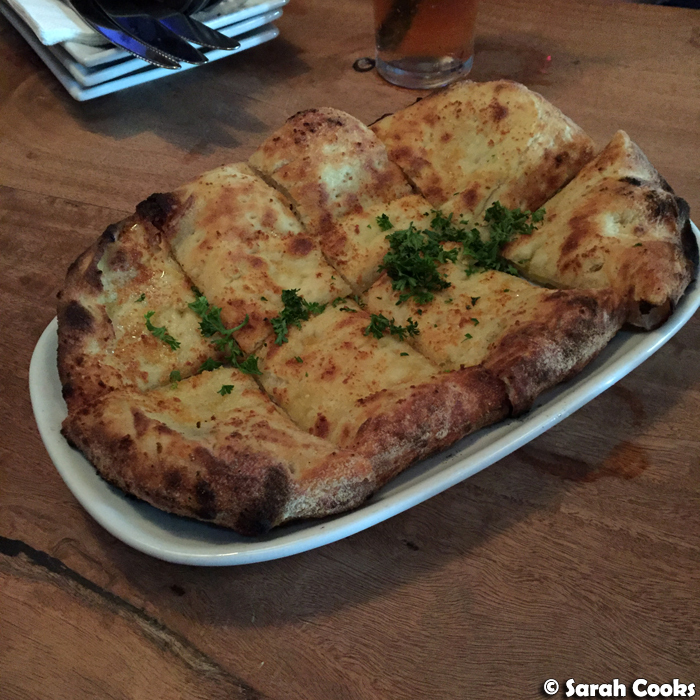 Prior to the trip I had researched a few places online and The Provincial was on my shortlist. 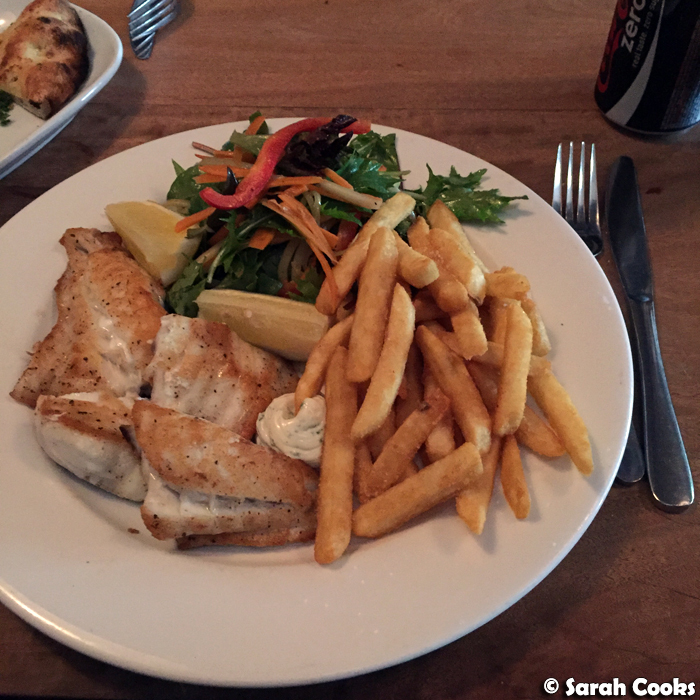 When I instagrammed our lunch, I got a comment from a lady who travels to Gero frequently for work, (Gero is what the cool kids call it, I've realised), and she said the best place for dinner was The Provincial. Boom. Decision made. The atmosphere in the pub was a little dark (it felt more pub than restaurant and it was still early), but the staff were nice and the food was satisfying. If you can't tell, we really wanted to fill up before a long night of work. I was also eating with two big guys with even bigger appetites! (Oh who am I kidding, you all know I ate the same amount as them). 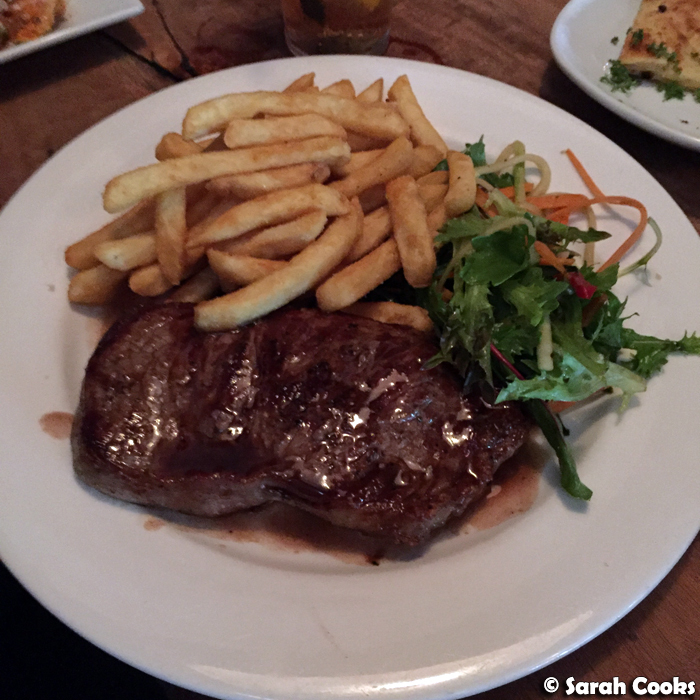 I think I did better than the boys, who each ordered a scotch fillet steak. These were fine but a little overcooked. I ordered local grilled fish (red throat emperor), and it was deeeelicious! Phew! And then it was onto another full night of work, before quickly packing and making the journey home. 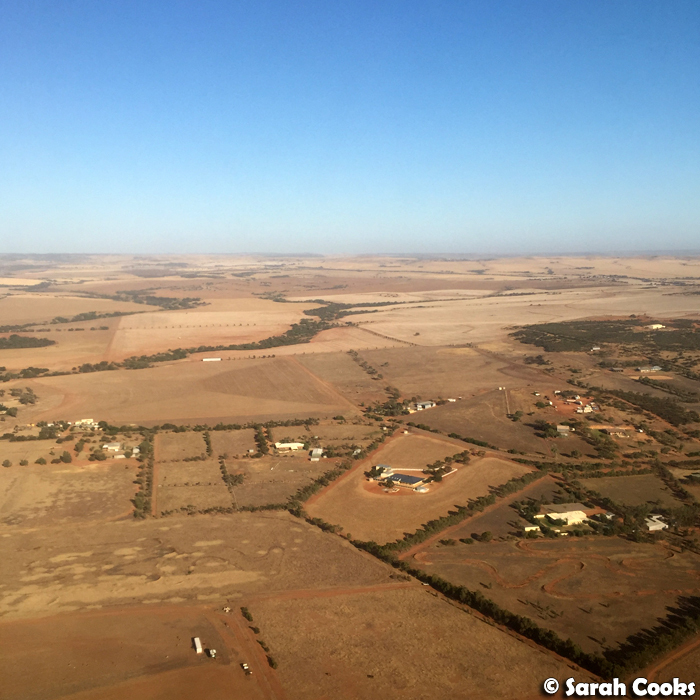 Another tasty pie on the Geraldton-to-Perth flight! Perth Domestic airport is fine, food-wise, with all the usual outlets (Hudson's coffee, Red Rooster etc etc. ), but I quite liked The Local Food Store (Terminal 3). 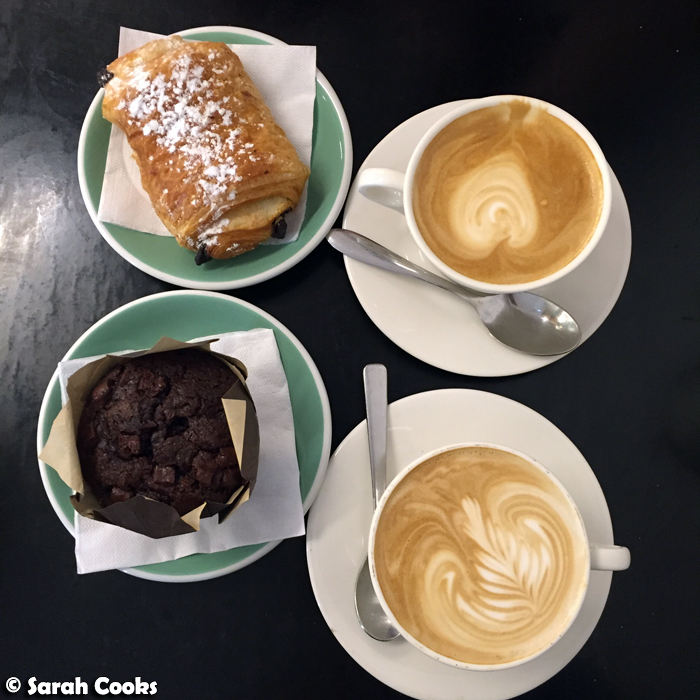 The coffees were better than I expected, and the pastries were pretty nice. That chocolate muffin had a surprise heart of Nutella. Score! 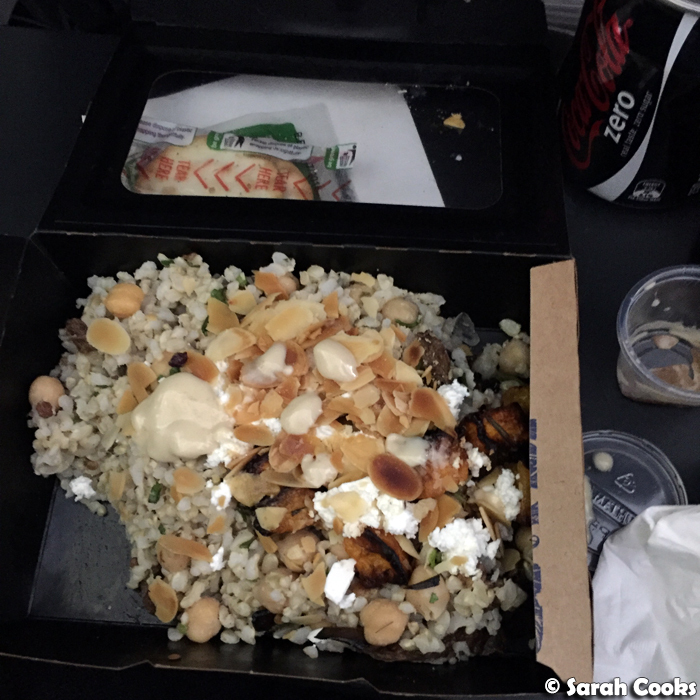 Another plane meal - this was a vegetarian grain salad with chickpeas and roast pumpkin on the Perth-to-Melbourne flight. Ok, and this last picture isn't from Geraldton, but I wanted to share it with you anyway! 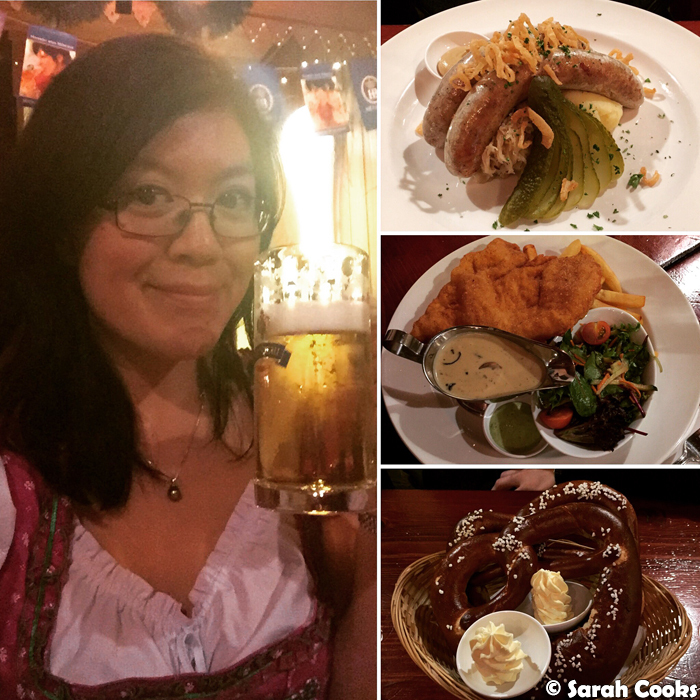 The night I got back from Geraldton was the same night that my German class was having our end-of-year celebration at Hofbräuhaus (18-28 Market Lane, Melbourne VIC 3000), and I did not want to miss out! My plane landed at 7:30 and dinner was scheduled for 8:30, so I figured I'd be fine if I took a cab straight from the airport. However, weeks before, I had promised my German teacher that I'd wear my Dirndl (Bavarian beer maid outfit) to dinner if she wore her Dirndl too. There wouldn't have been any time to change, and I didn't want to let Frau Jenny down, so yeah, I totally packed my Dirndl for the trip, put it on in the morning in Geraldton, and wore it through two cab rides, three airports, and both flights all the way back to Melbourne. Totally worth it! Prost! 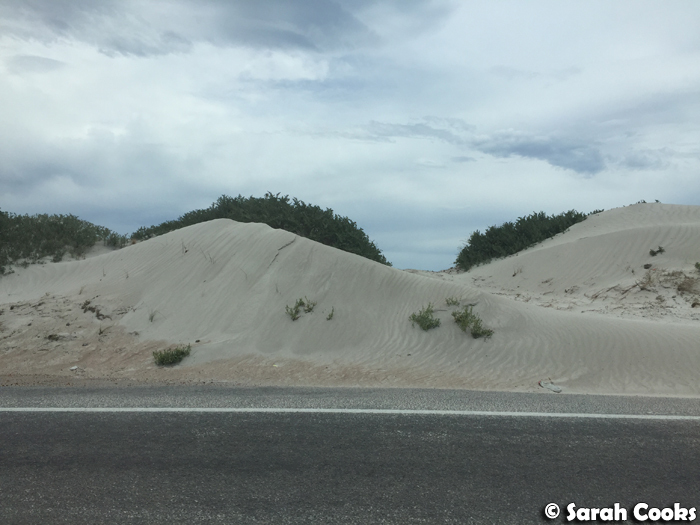 And that was my whirlwind trip to Geraldton! Have you ever been? 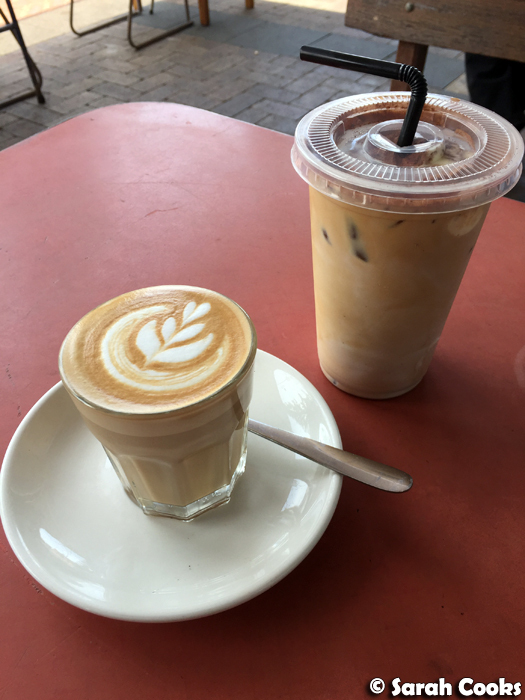 Do you have any restaurants or cafes to recommend? If so, please hit me up in the comments! Hehe what a strange seatmate! 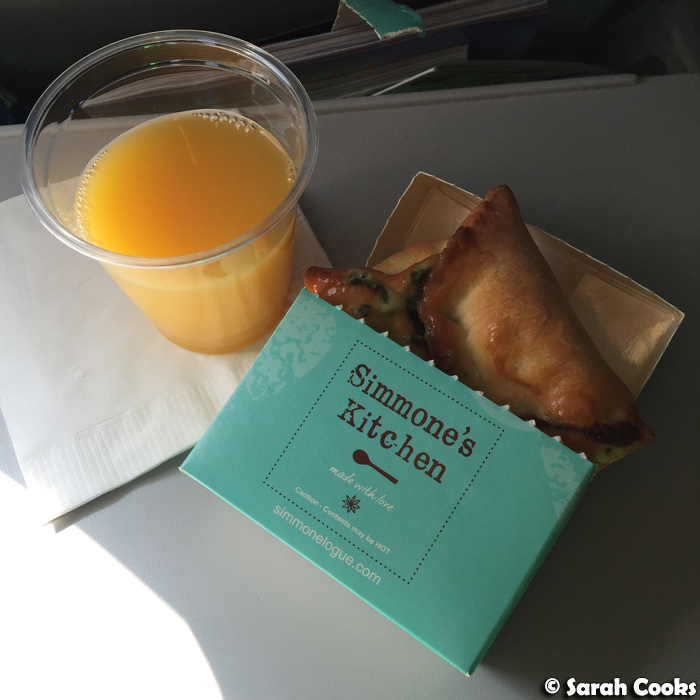 Heaps of people take photos of their airline meals. Meh, don't worry about them. I'm all about jaffles and those look like winners! I'm obsessed with airplane food and I always take photos!